“Marilyn Manson Ate My Girlfriend”, “May The Horse Be With You”, and “Chapstick, Chapped Lips and Things Like Chemistry” are a few of the silly song titles this Tuesday’s band has used over the years. If you aren’t a fan of some form, then you have no idea who I am referring to. The band is Relient K. Yep, just like the old Plymouth K car only spelled with an “e” instead of “a”. Relient K is a Christian rock band and has forever been known for their tongue in cheek songs and lyrics, as a matter of fact one of my favorite older albums from them is called “The Anatomy Of The Tongue In Cheek”. Their form of music would be called tongue in cheek pop/punk. 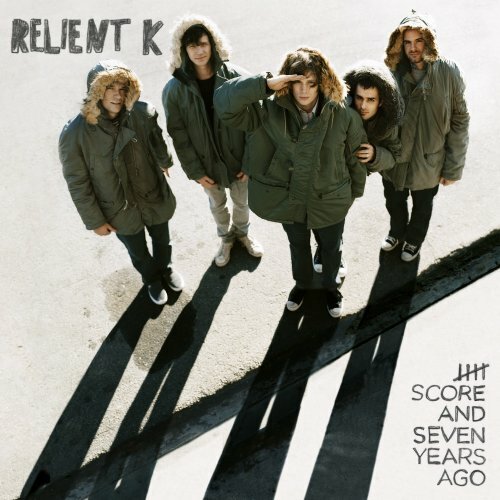 The band Relient K named for guitar player Matt Hoopes’ Plymouth Reliant K car, is also Matt Thiessen who is the lead vocalist, guitar and piano, David Douglas on drums, John Warne on bass, and Jon Schneck who also plays guitar and other stringed instruments. I have liked almost everything they have ever done, and the new album is no exception. The new album is titled “Five Score And Seven Years Ago” released March 6th, 2007 is a masterpiece of modern rock music. The first track playfully starts things off in an acappella/doo wap styled song in “Plead The Fifth”. The next track “Come Right Out And Say It” is a very mature song about telling the truth no matter if the recipient is going to like hearing it or not. This is followed by guitar bonanza called “I Need You” about the hole in our lives and hearts that can only be filled with Christ, and not the many things that we try to fill it up with. “The Best Thing” is the next song on the album and is their newest video release as well. The song is driven by Matt Thiessen on piano and is about relationships and the way they are give and take and most times the best thing. The next two songs “Forgiven” about, guess, forgiveness and “Must Have Done Something Right” are a couple of my favorite songs on the album. The rest of the songs are very good as well. Then at the end comes their album-ending, 11-minute musical and lyrical masterpiece: “Deathbed” (which features the voice of Switchfoot’s Jon Foreman). This is a masterful ballad about regret and forgiveness that brought me to tears the first time I heard it. Exceptional album highlights are : “Come Right Out And Say It”, “Forgiven”, “Must Have Done Something Right”, “I’m Taking You With Me”, “Faking My Own Suicide”, “Bite My Tongue”, and “Deathbed”. The boys K have indeed created a musical product to enjoy and turn our friends on to. If you are a fan and, excuse me, don’t own it yet, what are you waiting for? I definitely give this album 5 out of 5 stars. Please check the video below of their new single release “The Best Thing” and check out one of their other video’s for “Must Have Done Something Right” which I posted earlier this year.